It all started with a visit from our school principal, Maureen Trenary, in early December asking about the details and the price of an upcoming pilgrimage I was going to be leading in March. We both knew the Holy Spirit was at work on this project and that this was going to be a great adventure for everyone involved. 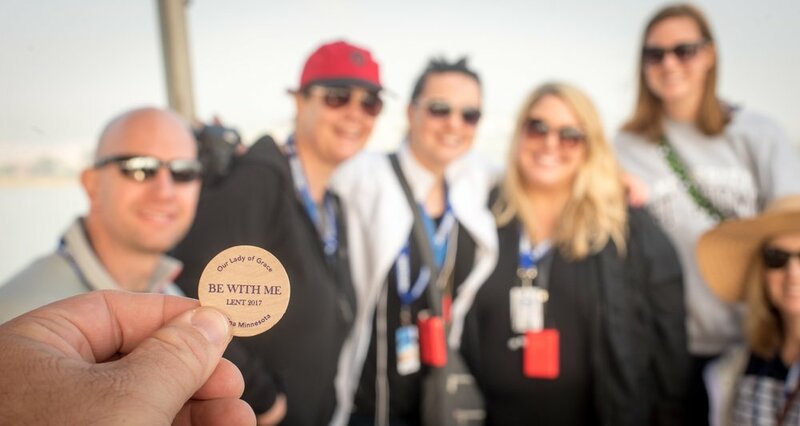 We received a grant from the Catholic Schools Center of Excellence which covered some of the cost, and had some very generous benefactor's who were interested in this great opportunity to reward and give these educators a new opportunity to experience our Lord's life up-close-and-personal! After selecting 13 educators from Our Lady of Grace Catholic School to join me on this pilgrimage with 206 Tours, we began planning and meeting. This was certainly going to be a trip they would NEVER forget! DAY ONE - Traveling...and more traveling. We arrived into Tel Aviv on Sunday, March 5th to a beautiful Sunset! After Mass and dinner, went for a walk along the Mediterranean Sea, to the ancient city of Jaffa, where we ran into a wonderful priest who gave us a private tour of Saint Peter's Church! He was headed out to buy peanuts, and willingly took us in for a look around! This is what the Church of Saint Peter looks like during the day. After a good nights sleep, we awoke to a beautiful scene along the sea! We departed Tel Aviv and headed north up the coast, to the Herodian city of Caesarea Maritima. This ancient port city was built by Herod during 22-10 BC, and features a Roman theater, aqueduct, and hippodrome - a stadium for horse racing and chariot racing. Remnants of the tile floor, in the original bathing pools of the Herodian palace. North of Caesarea about 26 miles, is another ancient port city of Haifa. It sits at the foot of a very large mountain range, atop which sits the Stella Maris Carmelite Monastery. This is where the Carmelite Monastery finds it's home, and the order claims it's roots. 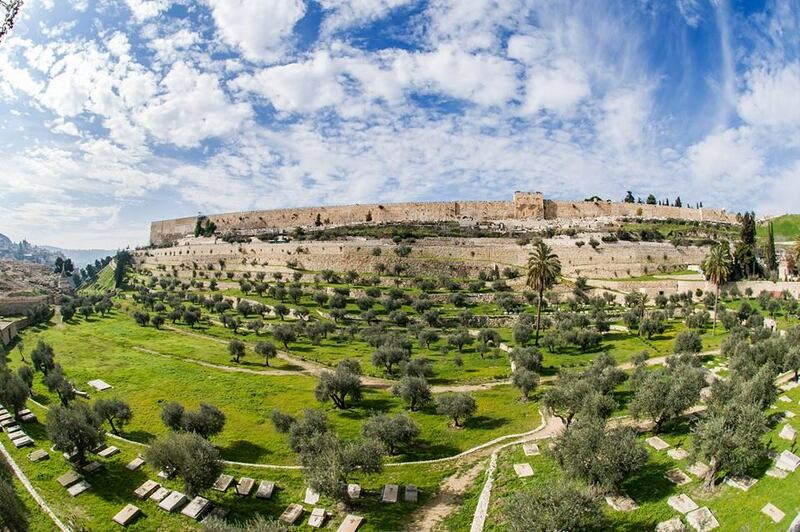 Located in this area is a cave where it is recorded in scripture that Elijah setup lodging (1 Kings 19:9-18). Today, the Carmelites have a very beautiful Church located on this Mountain top! On our way to Nazareth, we passed through the Jezreel Valley - a large, fertile plain and inland valley south of the Lower Galilee region. The Basilica of the Annunciation sits atop the cave where the Angel Gabriel visited the Virgin Mary, our Mother, and the Word became flesh. The first shrine was likely built sometime in the middle of the fourth century, but the current sturcture dates to 1969. Many nations have sent mosaic images of the Annunciation scene to be displayed in this Church. The one below is from Japan, and is comprised of real pearls. The cave where the Angel Gabriel visited the Virgin Mary and the Word became flesh. We had Mass in the Chapel of Saint Joseph, built over the excavated workshop where Saint Joseph worked. We celebrated the Mass of the Annunciation. It was a beautiful Mass - Mrs. Deb Skinner, our music teacher, played the organ! Near the workshop, an important discovery was made - they found a baptismal font, where many Christians in the first centuries of the Church would have been baptized! Next, we went to Cana - the site of Jesus' first Miracle. Here we offered to the married couples on the trip, the opportunity for them to renew their wedding vows. Getting up bright and early the next morning, we embarked on a morning boat cruise on the Sea of Galilee. Synagogue where Jesus first preached. The shore where Jesus called his disciples. Many of the homes would be grouped into multi-units. The home of Peter's mother in-law. We celebrated the Mass of the Apostles - calling to mind how we are all unified under the headship of the Apostles in the Church, and how Jesus left us a Church and a mission to spread His Good News of Healing and Peace to all the world! ...to be continued. Onto part two! We began with a winding drive up Mount Tabor, to the site of the Transfiguration - my favorite place in the Holy Land! Ein Karem - the village in Jerusaelm where Elizabeth lived, where Mary visited, and where John the Baptist was born. The spot inside the silver star denotes the place where Jesus was born. In the Chapel of Saint Jerome, we celebrated the Mass of Christmas, and sang Christmas songs! Saint Jerome spent 30 years translating the Bible here in Bethlehem, from the original languages of Hebrew and Greek. Bethlehem is in Palestine, which is surrounded by 500 miles of wall...built by Israel, funded completely by the United States, to keep Palestinian citizens from entering into Israeli territory. Most of the 160,000 Christians that call Israel home, live in Palestinian territory, and many live in Bethlehem; behind this wall. The wall restricts access to jobs, money, and opportuntity. 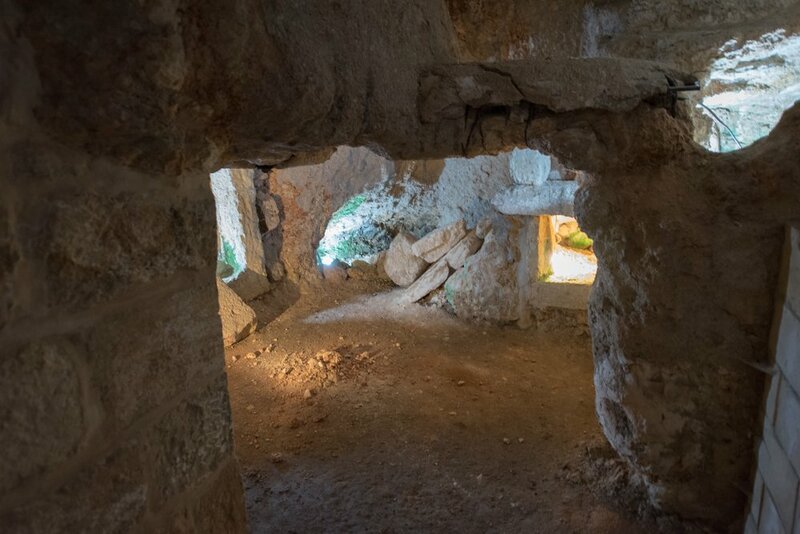 The cave, where it's thought that Jesus taught His disciples to pray the Our Father. We had a Mass at Dominus Flevit Church. Dominus Flevit is Latin for, The Lord Wept. The Church is shaped like a teardrop. This is thought to be the rock where Jesus sweat blood. This is a Greek Orthodox Church, which commemorates the death of Mary. We, in the Latin Rite Church, do not believe that Mary died, but fell into a deep sleep called a dormition, and then was assumed body and soul into heaven. There are some cool things in this Church, however...such as the Icons. These two icons below are unique, because they show Jesus standing above Mary, who appears to be dead, and show Jesus holding the child Mary. Typically we see Mary holding the child Jesus... This new image symbolizes the protection Jesus has for Mary in her death (Greek) / dormition (Latin). and that He has the power to take her now to Heaven. The original room was destroyed, but a Church was built on the site during the Crusader period. Today, the building is a muslim mosque. There is a pillar remaining from the crusader Church, which shows two infant pelicans (the symbols of Christ...or Christians) feeding from their mothers flesh. The Church that commemorates the dormition (falling asleep) of our Blessed Mother, before being assumed body and soul into heaven! The Western Wall is a small segment of a far longer ancient retaining wall, left over from the Second Jewish Temple, built by Herod the Great. It is considered Holy due to its connection to the Temple Mount. It has been a site for Jewish prayer and pilgrimage for centuries; a place for mourning the destruction of the temple. ...to be continued. Onto part three! Celebrated in the crusader chapel, dating from the 14th century. We celebrated the Mass of the raising of Lazarus. Deb Skinner rides a camel! The fruit in Israel is fantastic! 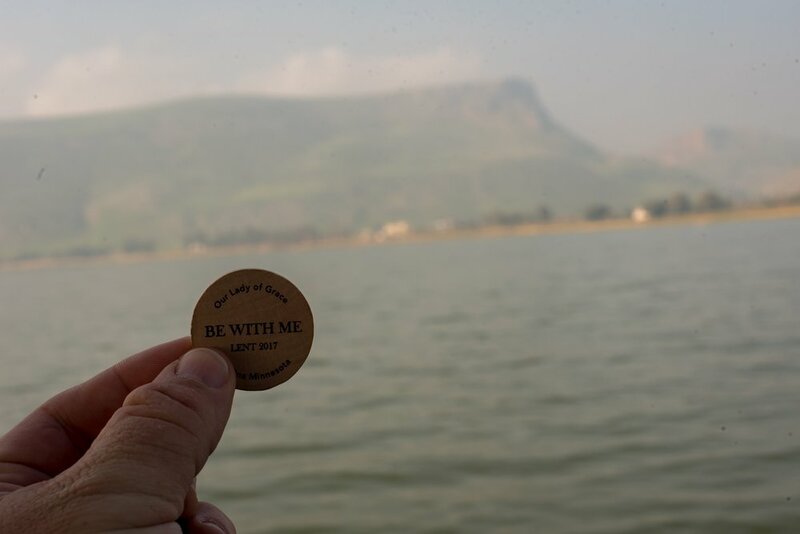 We went down to the Jordan River and renewed our baptismal promises. This is the site where the Dead Sea Scrolls were found. The Dead Sea Scrolls are the oldest manuscripts we have of the Old Testament. 4:30am wake-up call, in order to get started with the stations at 5:30am, so that we could avoid all the cramped street traffic, and shop owners which would soon be occupying the space, along the path to Calvary. We adore you O Christ, and we praise you - because by your Holy Cross, you have redeemed the world. The site of clavary. You can see the rock, on which Jesus was crucified, just below the glass. The final station is in the tomb - where Jesus was laid after He was lowered from the cross. 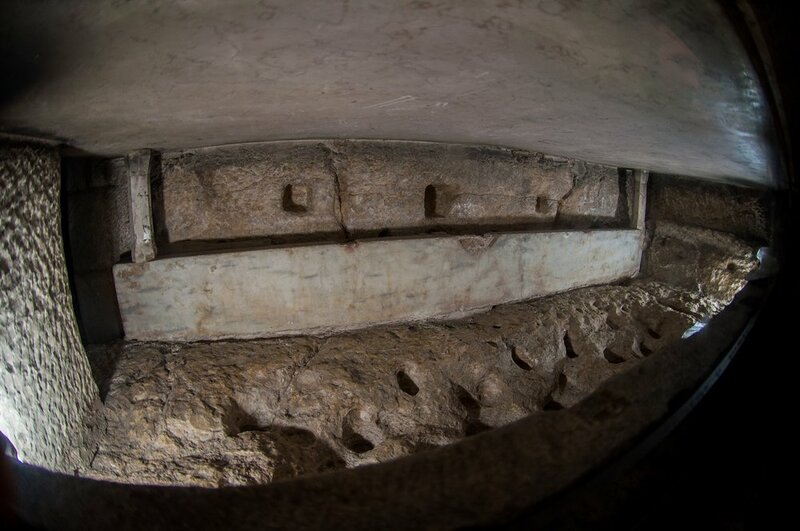 This is a newly installed window, that allows you to view the actual rock of the tomb where Jesus was laid! We were extremely fortunate to be able to have Mass in the Tomb. I celebrated the High, Chanted Latin Mass for the Franciscans, which was a great honor and priviledge. It was Easter Mass, of course! HE HAS RISEN!